Expired Scraper' is a powerful scraping tool that finds thousands of high quality domains with backlinks from the most trusted sites in the world, and available for registration. With 'Expired Scraper', all you need to do is to enter a site (if you don't have any ideas, you can browse the provided list of top sites by country and category) and let the tool do its magic... Come back 15 minutes later, and you will see a list of available domains the site links to, with all the most important metrics: Moz Rank, Moz Domain Authority, Moz Backlinks, Majestic Citation Flow, Majestic Trust Flow... You can of course order these domains by metric, and register them in just a few clicks, with the registrar of your choice. The best part is... All available domains go to the public pool after 3 days (72 hours), meaning that even if you reached your limit of daily or monthly searches, you can still find high quality domains. 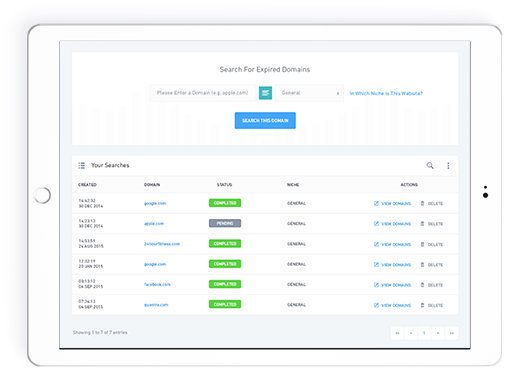 You can filter these domains by niche, and also set up filters, so you can be notified by email when domains meeting your criteria are added to the pool.